A restaurant’s menu is more than just a random list of dishes. It has likely been strategically tailored at the hands of a menu engineer or consultant to ensure it's on-brand, easy to read, and most importantly, profitable. Here are a few ways restaurants use their menus to influence what you’re having for dinner. 1. THEY LIMIT YOUR OPTIONS. The best menus account for the psychological theory known as the “paradox of choice,” which says that the more options we have, the more anxiety we feel. The golden number? Seven options per food category, tops (seven appetizers, seven entrees, etc.). “When we include over seven items, a guest will be overwhelmed and confused, and when they get confused they’ll typically default to an item they’ve had before,” says menu engineer Gregg Rapp. No shame in sticking with what you know, but a well-designed menu might entice you to try something a bit different (and a bit more expensive). Some restaurants have lost sight of this rule. For example, McDonald’s initially served just a few items but now offers more than 140. Yet the chain's revenue fell by 11 percent in the first quarter of 2015. “As we complicate menus, what we’re actually doing is tormenting the guest,” says restaurant consultant Aaron Allen. “When the guest leaves they feel less satiated, and part of it comes down to a perception that they might have made the wrong choice.” If you leave with a bad taste in your mouth, you’re less likely to come back. And in an industry where repeat customers account for about 70 percent of sales, getting diners to return is the ultimate goal. Including a nice-looking picture alongside a food item increases sales by 30 percent, according to Rapp. In one Iowa State University study, researchers tested a digital display of a salad on kids at a YMCA camp. Campers who saw the salad photo were up to 70 percent more likely to order a salad for lunch. “You respond to the image on the display like you would respond to a plate in front of you,” said Brian Mennecke, an associate professor of information systems. “If you’re hungry you respond by saying, ‘I’ll have what’s in that picture.’” This effect is even more powerful when it comes to digital signs that move or rotate, which fast food restaurants are beginning to implement. “The more vivid the image, in terms of movement, color and accuracy of representation, the more realistic, the more it’s going to stimulate your response to it,” Mennecke said. Of course, you can have too much of a good thing. “If you crowd too many photos, it starts to cheapen the perception of the food,” Allen says. “The more items that are photographed on the menu, the guest perception is of a lower quality.” Most high-end restaurants avoid photos to maintain a perceived level of fanciness. 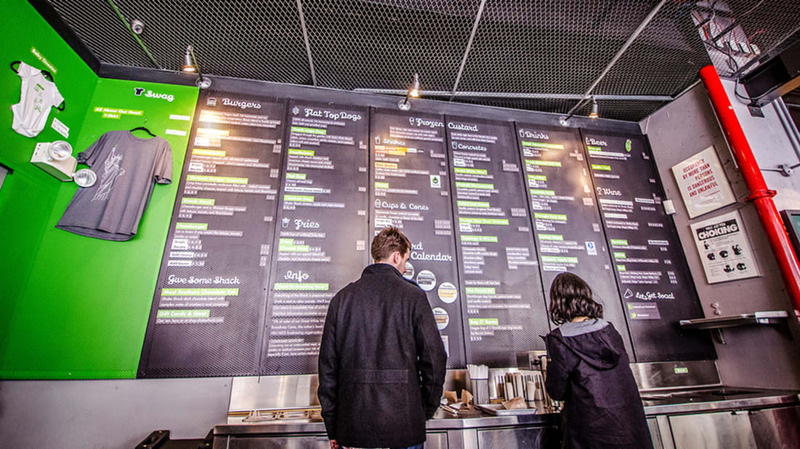 Dotted lines leading from the menu item to its price are a cardinal sin of menu design. “That menu was introduced before modern typesetting,” says Allen. “It was a way of keeping the page looking properly formatted, but what happens is the guest reads down the right side of the menu and then looks to the left to see what the lower price point can afford them.” The solution? “Nested” pricing, or listing the price discretely after the meal description in the same size font, so your eyes just glide right over it. 4. THEY USE EXPENSIVE DECOYS. On menus, perspective is everything. One trick is to include an incredibly expensive item near the top of the menu, which makes everything else seem reasonably priced. Your server never expects you to actually order that $300 lobster, but it sure makes the $70 steak look positively thrifty, doesn’t it? Slightly more expensive items (so long as they still fall within the boundaries of what the customer is willing to pay) also suggest the food is of higher quality. This pricing structure can literally make customers feel more satisfied when they leave. For example, one study gave participants an $8 buffet or a $4 buffet. While the food was exactly the same, the $8 buffet was rated as tastier. 5. THEY PLAY WITH YOUR EYES. According to Allen, different colors help conjure feelings and “motivate” behavior. “Blue is a very soothing color, so often times it is used to create a calming effect,” he says. And have you ever noticed the number of restaurants that utilize red and yellow in their branding? Conclusive evidence on how color affects our mood is hard to find, but one review suggests that red stimulates the appetite, while yellow draws in our attention. “The two combined are the best food coloring pairings,” Allen says. 7. THEY USE FANCY LANGUAGE. Longer, more detailed descriptions sell more food. Nearly 30 percent more, according to one Cornell study. “The more copy you write on the menu item, the less it costs in a customer’s mind because you’re giving them more for their money,” explains Rapp. So plain old “chocolate pudding” becomes “satin chocolate pudding.” Customers also rated the more thoroughly described food as tasting better. Adjectives like “line-caught,” “farm-raised,” or “locally-sourced” are big turn-ons for customers. “These things all help increase perception of quality of the item,” Allen says. This verbiage is so effective that many states have “Truth in Menu” laws designed to prevent restaurants from lying about things like how a piece of meat was raised or where it originated. 8. THEY MAKE YOU FEEL NOSTALGIC. We all have that one meal that takes us back to childhood. Restaurants know this tendency, and they use it to their advantage. “Alluding to past time periods can trigger happy memories of family, tradition, and nationalism,” one study says. “Customers sometimes like the feeling of tasting something wholesome and traditional because ‘They sure don’t make ‘em like they used to.’” Keep that in mind the next time you’re tempted to order “Grandma’s Chicken Soup."